A few weeks ago I was having an iMessage chat with my beautiful friend Carrie about creating pesto sauces without added oil or dairy. It wouldn't be very traditional but it could still be very yummy! We talked about using extra pine nuts or even oilier nuts like macadamia to get a good consistency. I haven't tried that yet but I did make two different pesto style salad dressings that I think Carrie would (mostly) approve of! 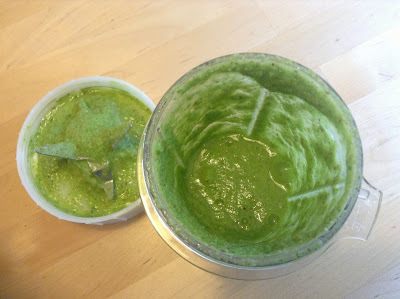 The first time I used a big handful of fresh basil, a clove of garlic, cashew nuts, water, a whole lime (without the peel), and a touch of salt. It was delish! I ate it on a big salad and also spread it on sliced tomato like a cracker. SO YUM! 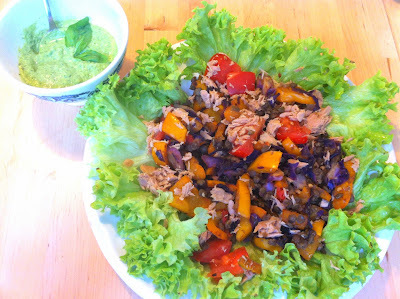 Salad with lettuce, cooked purple cabbage, yellow bell pepper, lentils, tuna, tomatoes. The second time I used big handful of fresh basil, a clove of garlic, hazelnuts, water, a half lemon (without the peel), and a touch of honey. It was also delish! I ate it on a big salad. I found it needed a touch of salt. Salad with lettuce, turnip greens, chickpeas, serrano pepper, tuna and tomatoes. In case you are wondering why I avoid the oil and dairy here, there are a few reasons. Carrie comes from a vegan, nutritarian perspective which disallows animal products and avoids added oils. (she wouldn't like my honey and salt, but it can easily be left out) Basically I think it is better to limit processed fats in the diet when possible. Even olive oil is not found in nature in a bottle. So I try to get my fats from whole foods most of the time. Why no dairy? Well, indeed I do love my cheese but sometimes it is nice to skip it. Coming up tomorrow, my trip to the local goat farm! Fresh eggs from wild chickens! Fun! ps: the tribest is waiting for you to use it when you visit!